Bhakti means to offer with love and devotion anything one does in life to God. Bhakti means love of God or, as Srila Prabhupada would often translate the word, pure devotional service to God. (The Sanskrit root of the word bhakti is bhaj, which means “loving service.”) Bhakti is the essence of the eternal relationship we souls have with Krishna. In material existence, our Bhakti is covered by our material consciousness and misdirected away from Krishna and toward the temporary things of this world. Therefore we are never fully satisfied. We can awaken our natural Bhakti by practicing Bhakti. In other words, we can awaken our love for Krishna by performing acts of love for Him. Since yoga means “connection, ” the process by which we connect with Krishna through acts of love is called Bhakti yoga. There’s much more to loving God than just saying, “I love God. ” We attain pure love for Krishna through a gradual process that takes us through progressively higher realms of Bhakti. Fortunately, we can begin the process at any point in life or wherever we are in our spiritual journey. The Bhakti process is systematic and is laid out in detail by the followers of Sri Chaitanya in books such as Bhakti-rasamrita-sindhu (presented by Srila Prabhupada as The Nectar of Devotion). These books provide not only instructions but also guideposts by which the student of Bhakti can evaluate his or her progress. The awakening of Bhakti takes place in three progressive stages: (1) regulated practice, (2) attachment, and finally (3) pure love. Bhakti connotes devotion, or love, and love implies service. Service refers to that activity which is intended to please the beloved. Thus “devotional service” is an eloquent definition of Bhakti. Love is the most fundamental drive of every living entity. We cannot be happy without satisfying this desire to love, and we will not be able to perfectly fulfill this desire without permitting its expansion to the most inclusive extent. Love can become all-embracing only when we understand that Krishna is the supreme beloved, the root of all creation. By embracing Him we successfully embrace everyone, just as pouring water on the root of a tree successfully nourishes every leaf and branch. The Nectar of Devotion teaches us the science of loving every one of the living entities perfectly by the easy method of loving Krishna. The word yoga means “to connect.” Though yogas are commonly used for health and fitness, the Vedic texts explain that yoga is meant to connect with God. 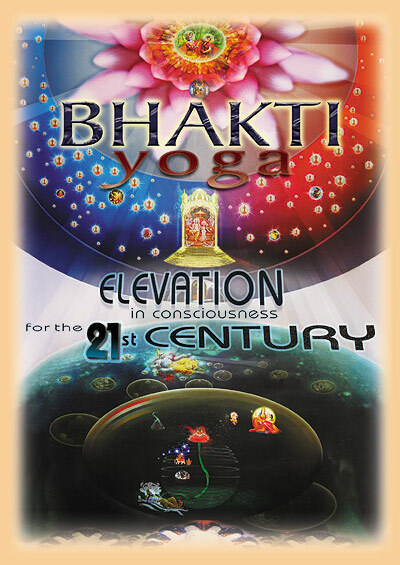 Bhakti means “devotion,” or “devotional service,” or “pure love.” So Bhakti-yoga means to practice connecting with God, and reestablishing our relationship with Him, through acts of love and service, or devotional service.